To configure the hatch used by a manual or automatic cut view, we need to access the database corresponding to the used drawing style category and change the hatch used by the configured style presentation. A) Open Management Tools and go to: "Table editor". AstorAddIn.mdb - C:\ProgramData\Graitec\Advance Steel\2011\User2\Data (for drawing styles used from the "User" category). C) Open the DetHatchSettings table. D) The various types of hatches that can be configured into an object presentation are available. The default hatch, used by both automatic and manual cut views, is Default Front. - PatternName. We can use any pattern available in AutoCAD in addition to the ones added by the Advance Steel installation. - Scale - scale of the pattern. Default is - 1. - Angle - angle of the pattern. Default value is 0. The pattern is rotated counter clockwise for positive values. "-1" - Read code from defaults. If we use this setting, then the color will be read from a specific default value. For example, for the Default Front hatch, it will read the color from the "Drawing-Presentation / Color of planes of intersection" default. E) After we configure the hatch, close the Management Tools and use the "Update defaults" function in Advance Steel to include the modification. Note: In order for the modification to take effect on detail drawings, we need to recreate them. 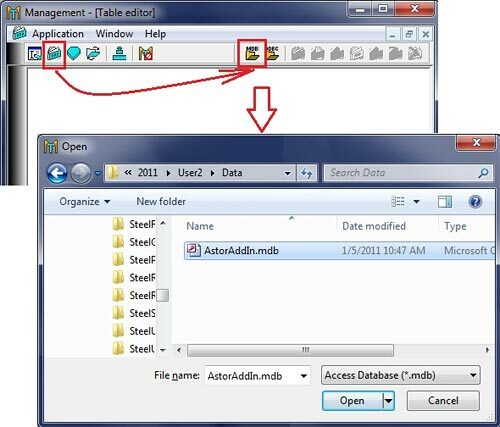 A drawing update will not change any of the modified settings done to the database table.